Michael S. Cookson, MD, MMHC, is Professor and Chairman of the Department of Urology at the University of Oklahoma Health Sciences Center, and holds the Donald D. Albers Endowed Chair in Urology. H has authored 240 peer-reviewed journal publications, 33 chapters of various textbooks, and is nationally recognized for his outstanding contributions to urologic oncology. Dr. Cookson completed his Urology residency at the University of Texas, San Antonio and completed his Urologic Oncology Fellowship at Memorial Sloan-Kettering Cancer Center in New York. From 1998 to 2013, he served as the Vice Chairman of Urologic Surgery and Director of the Urologic Oncology Fellowship Program at Vanderbilt University. Dr. Cookson has devoted much of his academic career to the management of patients with urologic cancers, with a strong emphasis on Clinical Guidelines, Education and Evidenced Based Medicine. He was a member of the AUA/ABU examination committee for 10 years, including a member of Task for Cancer, Oncology Consultant and Pathology editor. He also serves on the ABU Oral Examination Committee. He is a co-founder of the OKAT, an SUO mandated oncology examination, for which he served as Chair for 5 years. In 2011, he received the President’s Distinguished Service Award from the SUO for educational contributions. He received the 2018 AUA Presidential Citation for Outstanding Service for his role in the development of the OKAT and as chair of the Castration-Resistant Prostate Cancer Guideline at the AUA 2018 Annual Meeting. Michael S. Cookson, MD, MMHC, reviews highlights from the recently released American Urological Association (AUA) Guidelines for muscle invasive bladder cancer (MIBC). 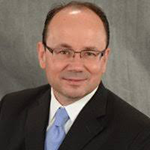 He focuses on initial patient evaluation, the use of neoadjuvant chemotherapy, perioperative management, patient selection for bladder preservation, and surveillance following treatment. 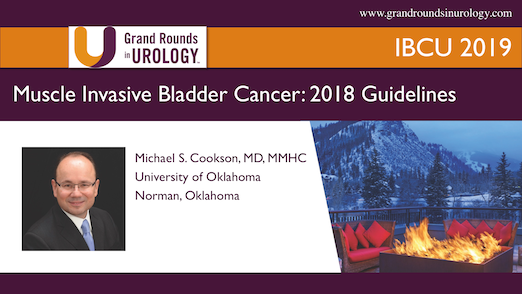 Michael S. Cookson, MD, MMHC, reviews practice-changing recommendations from recently updated guidelines for non-muscle invasive bladder cancer (NMIBC). He specifically emphasizes the importance of variant histology and risk-stratification in treatment decision-making for NMIBC. Michael S. Cookson, MD, discusses prostate MRI as an upfront assessment for targeting lesions in biopsy naive patients and the conclusion from PROMIS and PRECISION regarding this application. He also reviews the potential applications of MRI in patients with prior negative biopsy and in those on active surveillance. Michael S. Cookson, MD, describes the components of a quality transurethral resection of bladder tumor (TURBT), enhanced detection technologies such as blue light cystoscopy and narrow band imaging (NBI), and the induction of these new technologies into the American Urological Association (AUA) and Society of Urologic Oncology (SUO) bladder cancer guidelines and common practice.